For years experts predicted biosimilars, the copycat versions of biologic medicines, would save the U.S. tens of billions in healthcare spending over the coming decades. So far, however, that hoped-for impact has yet to materialize. The Food and Drug Administration has approved 11 biosimilars, but only three are on the market — thanks to patent litigation that's tripped up entry of the rest. It's one of the clearest examples of the challenges confronting the FDA as it tries to combat rising drug prices by boosting competition. Legally, the agency has few levers to pull when it comes to addressing prices. 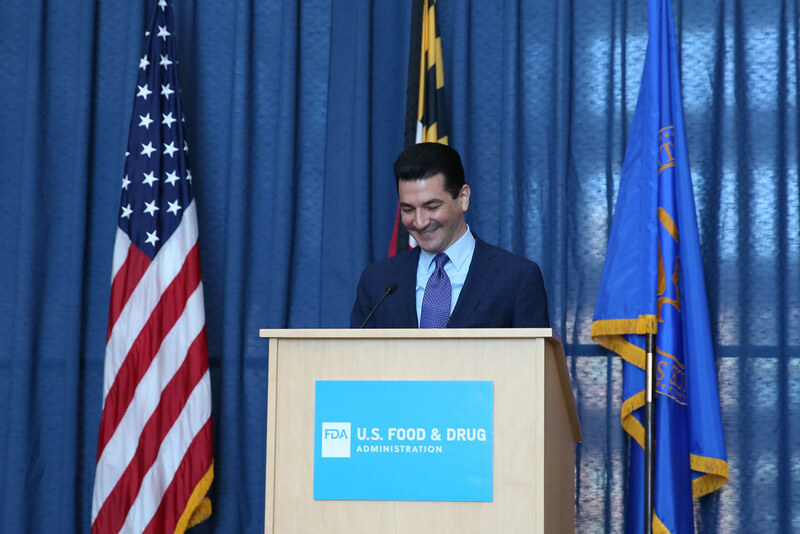 But that hasn't stopped Commissioner Scott Gottlieb from taking a more spirited and vocal approach than past FDA chiefs. The effort comes as eye-popping price tags, some spurred by groundbreaking new treatments but others by manipulation of the drug pricing system, have prompted public and political opposition to rising drug costs. Gottlieb has aggressively used public statements to call out drugmakers for blocking or impeding market competition. And, under his leadership, the FDA has continued to ramp up approval of generic and biosimilar drugs, while pushing the boundaries of regulatory flexibility. "It's not like Commissioner Gottlieb is the first Commissioner to think about pricing or even make public statements about drug pricing," said Jacob Sherkow, a professor of law at New York Law School. "[But] he has definitely been the loudest." As the market for biosimilars shows, though, even the agency's best efforts can run up against hard checks on its ability to shape market behavior. By law, the FDA can't set prices. It's charged with assessing the safety and efficacy of medical products, but isn't allowed to consider the price of those products in making its approval decisions. Other countries, like the U.K., have set up special government agencies to determine the cost-effectiveness of new therapies and whether they should be covered. But in the U.S., that task falls to insurers, not regulators. "What can FDA do directly to regulate drug prices from a legal perspective? The answer is not much," explained Sherkow. "Where the FDA does have authority to get involved is in how much, in what way, and how aggressively it approves drugs, or their generic or biosimilar competitors." While it's an indirect effect, approving low-cost competitors more quickly can be a powerful force for lowering prices. Research by the FDA has found, for example, that average prices drop by nearly half after approval of a second generic copy of a branded drug. Under Gottlieb, the FDA has continued to ramp up the pace at which it OK's generic drugs and, last month, it tallied a record 126 approvals. Total approvals in 2017 also set an annual high-water mark. Yet, speeding competitors to market can only go so far if other forces block lower-cost rivals from reaching patients. To date, that's exactly what's played out with biosimilars. In recent months, Gottlieb has expressed frustration that the FDA's steady increase in approving biosimilars hasn't resulted in greater savings. "Competition is, for the most part, anemic," he said in a July speech introducing the agency's plan to boost the role biosimilars play. Gottlieb criticized tactics branded biologic makes have used to forestall competition, calling out "rebating schemes" and "patent thickets" as toxins spoiling competition. His willingness to speak publicly and directly on these issues is something that didn't happen as often in the past, notes Scott Lassman, a partner in the technology and life sciences group at Goodwin, a law firm. But the problems are not something that the FDA has much power to change on its own. Drugmakers like AbbVie, which makes the best-selling biologic Humira (adalimumab), have reached settlement deals with makers of approved biosimilars to push off market entry. In the case of Humira, a low-cost option likely won't be available until 2023, despite two biosimilars already approved. Elsewhere, Johnson & Johnson, the maker of branded Remicade in the U.S., has used rebates and contracts with payers to blunt the immediate effect of biosimilar copies from Pfizer and Merck & Co. Neither examples are areas in which the FDA has authority. "[Gottlieb] has been quite explicit about some of the gaming tactics that innovator pharmaceutical companies are engaged in that delay generic competition," said Rachel Sachs, an associate professor of law at the Washington University School of Law. "But his ability to crack down on them isn't as complete as he might like." Still, the FDA appears to be exploring how it might work with other agencies that can. In his July remarks on biosimilars, Gottlieb said the agency was taking efforts to coordinate with the Federal Trade Commission to address "anti-competitive behavior." And in the meantime, the pace of biosimilar approvals has picked up. More than a year passed between approval of the first biosimilar, in March 2015, and the FDA's OK of a second. Since last spring, however, the FDA has pushed eight more biosimilars through. While approving generic and biosimilar drugs may be the main mechanism by which the FDA can influence prices, Gottlieb has made full use of his public platform to call out market "shenanigans" by drugmakers. One of his first targets was abuse of a safety monitoring program known as REMS, or Risk Evaluation and Mitigation Strategies. Required by the FDA for certain drugs to ensure safe use, REMS programs have in some cases been used to to block generic firms from accessing needed samples of branded drugs by which to develop cheaper copies. Gottlieb received a lot of media coverage by attacking such practices as "regulatory gaming," and has since kept up pressure on drugmakers through public statements. In one particularly notable speech, the commissioner attacked the corrosive effects of what he dubbed "Kabuki drug-pricing contracts" in the market for biosimilars. Such naming and shaming can only go so far, of course. In the case of REMS, the FDA can shape the framework for such programs — such as reviewing whether generic companies development plans would comply with REMS requirements — but its powers are limited to sanction bad behavior. Nevertheless, the FDA's role as arbiter over what drugs companies can sell puts it in a position where its words carry weight. "Maybe unlike any other agency, FDA is the agency that stands in the way from companies having nothing more to show for their work than half a page of scribbled lines or a blockbuster, multi-billion-dollar-a-year drug," said New York Law School's Sherkow. "So when FDA says jump, companies say how high and on what form." The FDA has followed through on some of Gottlieb's criticisms, too — at least to the degree that it can. In May, the agency published a list of 52 medicines which generic companies were having trouble obtaining samples for, putting public scrutiny on their makers. In doing so, Gottlieb said the FDA would also be notifying the FTC about inquiries it receives from companies alleging uncompetitive practices. Additionally, Gottlieb's public stance could act as a call to Congress to look into addressing issues the FDA can't. Last month, for example, legislation was introduced in the House of Representatives that would require agreements between biologics makers and biosimilar companies to be reported to the FTC and the Department of Justice. A similar measure, meanwhile, is being mulled in the Senate. As Health and Human Services Secretary Alex Azar and Gottlieb continue to criticize pricing and anticompetitive practices, drugmakers are faced with a choice: ignore the growing chorus or cooperate. On pricing, the industry's playbook in the past has been to make small concessions while waiting for public pressure to subside. In 2016 and 2017, for example, many companies announced plans to limit annual drug price increases to below double digits — winning some initial plaudits but keeping their path to continued growth largely open. More recently, over a dozen drugmakers have called off planned price increases in response to President Donald Trump's criticism of Pfizer and intensifying pressure from the administration. While the moves are mainly temporary, the rare retreat suggests that sustained governmental pressure can shape pharma behavior on pricing. Whether drugmakers resume business as usual once the spotlight passes over will be a test of how much the administration can accomplish in the absence of major executive or legislative changes. Under Gottlieb, the FDA has pushed up against the limits of what it can do to influence pricing. Yet the more vocal stance could still yield results — especially as HHS and the White House remain focused on the issue. "Yes, he does need assistance from others. But, if I were a pharmaceutical company, I would get in line behind some of what he is proposing," Sachs noted. "He's simply proposing to curtail some of the worst abuses we're seeing from bad actors in the industry. And that should be a project that pharmaceutical companies want to get behind."